Preventing a back injury is much easier and cheaper than repairing one. The best way to prevent back injuries in workplace conditions with stairs and steps is with the right equipment. 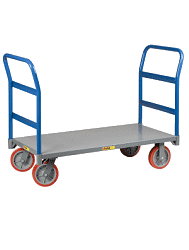 Our hand trucks greatly reduce accidents, property damage, and back injuries from dolly or hand-truck use in environments with stairs. Our stair-walking dollies are the equipment you need to decrease back injuries and increase efficiency.